Tamara Magel has developed a full service start to finish luxury design and build for your home project, Design | Build. This is where skilled craftsmanship and attention to every detail meet to deliver a beautiful luxurious home. This recent project is deep in the heart of Sagaponack South on Hedges Lane, among the area’s most significant homes, a newly constructed 11 bedroom estate on an ideal, double-wide, south-facing 2.3 acres. The seven bedroom main residence and four bedroom guest house is impeccably conceived down to the smallest detail yielding a depth of design that is custom, layered and rich. 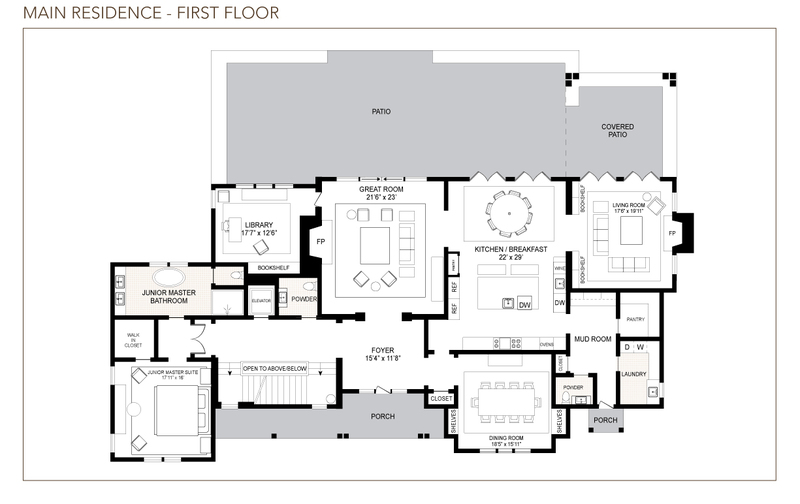 The 12,600+/- sq ft home is composed of perfectly proportioned, open-flowing spaces. Each room is thoughtfully planned with sophisticated hand-picked materials and individual character to achieve a distinctive relaxed vibe resulting in an inspired synthesis of a modern farmhouse aesthetic blended with a timeless European sensibility. The amenities in the 5,000+/- sq. ft. lower level include a large movie theater, a wine room, recreation room with a refurbished 1920s art deco pool table and a light-filled gym with sauna and floor to ceiling windows that look onto a Zen garden. The grounds are equally captivating. High mature hedges surround the property for maximum privacy, while the trees and plants within are artfully placed to maximize colorful views from every angle. The 60’ x 20’ pool has an inviting 8’ x 8’ inlaid spa and the north-south facing tennis court is seamlessly sunken with sloped grass surround. DESIGN | BUILD prides itself on execution from its inception with a sophisticated designer’s eye and a craftsman’s extreme focus on quality, the result is an entirely custom home built with attention to detail and exquisitely integrated into its extraordinary site. The artfully crafted details from all over the world–the finishes, textures, fixtures, and furnishings –come together to deliver impeccable construction and a flawless design. EXCEPTIONAL LANDSCAPE DETAILS The sprawling ultra-private grounds were thoughtfully planted to ensure that every line of sight provides a captivating view. Large specimen trees that have been growing on the property for years were lovingly saved and relocated within the grounds to preserve and respect the vegetation while also enhancing the charm. Carefully selected and positioned mature trees along with flowering plants combine with an expansive manicured lawn to create colorful and verdant spaces throughout the seasons. Designed for unwinding, the interior spaces are ultra sophisticated yet comfortable. Timeless pieces were custom made or handpicked from around the world and the result is an effortless blend of elegance and style. Tamara Magel’s keen eye for texture, and deliberate use of natural materials are quintessentially Hamptons. Rich and vintage textiles were selected from such places as Sweden and Tibet, while the exceptional assortment of accessories is curated fro mseveral upscale retailers such as Monc XIII, Home Nature and 1st Dibs. Distinctive light fixtures come from top designers such as Apparatus Studio, Fuse Lighting and Remains. The white oak floors were smartly lightened and treated to play off of the southern light that floods each room. Superb millwork bookcases, grass cloth wallpapers, and thoughtfully chosen wall treatments display the meticulous craftsmanship that went into every last detail. A CULINARY HAVEN The kitchen serves as a timeless gathering space and a chef’s functional ideal. The visually striking hand-crafted wood-beam ceiling complements the rich Calacatta marble countertops and textured backsplash, exuding warmth and creating the quintessential Hamptons experience. Nothing short of spectacular, a steel hand hammered hood was custom made for a dramatic anchor for the exceptional scheme. LOWER LEVEL AMENITIES Each lower level amenity is finished with the same level of excellence as the rest of the home. They include a large movie theater with wet bar, adjacent powder room, light-filled gym with shower and sauna, chic recreation room with a 1920s art deco pool table and an elegant wine room. The charming guest house is comprised of a cozy living room with wood-burning fireplace and four generously proportioned en-suite bedrooms. The first floor bedrooms each have French doors that lead to a bluestone patio away from the main residence and give access to the pool and tennis. Below are two beautifully decorated bedrooms, one of which overlooks the light-filled Zen garden. There are four entry points to the guest house ensuring that guests have independent living quarters to come and go with ease. More information about TAMARA MAGEL DESIGN|BUILD is available on request.